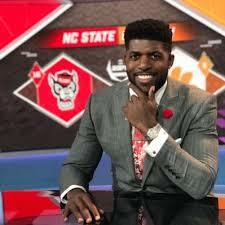 Emmanuel Chinedum Acho popularly known as Emmanuel Acho is a former American football player currently working for ESPN as their analyst. During his NFL career, Acho played with several famous clubs including Cleveland Browns, Philadelphia Eagles, and New York Giants as their linebacker. Acho earns around $75,000, annually and has an estimated net worth of over $3 million. Currently, he is in a relationship with his girlfriend Yvonne Orji, a Nigerian-American actress. Emmanuel Acho was born on November 10, 1990, in Dallas Texas to parents Sonny Acho and Christie Acho. Emmanuel spent his childhood with his older brother Sam. As per his nationality, he is American and belongs to Mixed ethnic group. Further, Emmanuel Chinedum Acho has an older brother named Sam. His brother plays as a linebacker for the Chicago Bears having previously played for Arizona Cardinals. Acho received his early education from St. Mark's School Of Texas. After completing high school, he joined the University of Texas at Austin and completed his Bachelor's in sports management. The American sports analyst/former player Emmanuel Acho has an estimated net worth of $3 million. As of 2019, the reporter receives an annual salary of $75,000 from his successful reporting career with ESPN because of his work experience. Acho has earned a lot of money from his playing career which is reported to be $1,297,685. Emmanuel also earned a quite good sum of money from advertisements and sponsorships. Peyton Manning is the highest earning player in the NFL history with total career earnings of $248 million. Currently, Acho is working for one of the most recognized Sports networks in the world and is also well known for paying a decent amount of salary to its employee. Being a regular ESPN sports analyst, Acho receives a good amount as his salary. Emmanuel started his career as a player in the 2012 NFL Draft with Cleveland Browns but he missed the 2012 season after an injury. Later he was traded on April 11, 2013, in exchange for Dion Lewis to Philadelphia Eagles. After that, New York Giants signed him the same year for the practice squad. Later, Philadelphia again signed him replacing Jordan Hicks and was released from Eagles on 2015, November 24th. During his time in Philadelphia, Acho played with some popular players including Sam Bradford, Jordan Matthews, and DeMarco Murray. Acho started his broadcasting career with ESPN in 2015 and is still working as a sports analyst for the network. Emmanuel Acho is currently in a relationship with the beautiful Nigerian-American actress and comedian Yvonne Orji. Before dating Orji, there were rumors about the relationship of Acho and Hannah Delmonte, who is an Eagles fan. Their conversation started after Hannah contacted Emmanuel on his Instagram and they both went to a prom. There is no information about him getting married or ha a wife. Yvonne Orjis was born in Port Harcourt, Nigeria and completed her education from Milken Institute of Public Health and Columbian College of Arts and Sciences. The famous sports analyst is 6 feet 2 inches tall in height and weighs around 240 lbs with black hair and a charming personality.